We’d love your help. Let us know what’s wrong with this preview of The Golden Hour by Malia Zaidi. To ask other readers questions about The Golden Hour, please sign up. This is a darker mystery than the cozy read that I expected. This is my first Lady Evelyn mystery but I had no problems keeping up with it. It's set in Scotland with Evelyn's aunt and cousins so it makes a nice setting. It started slowly for me but once it got going, the action moved right along. A nice mystery that kept me guessing. Thanks to Net Galley and the author, Malia Zaidi, for a copy of this enjoyable read. The Golden Hour was fourth cozy historical fiction in Lady Evelyn Mystery that was set in Scotland where Evelyn solve not just one but two murder mysteries. It was about jealousy, unrequited love, obsession, tragedy, dysfunctional family, betrayal, grief and trauma of child loss, struggle of veterans and finding a hope to live and love again. Initial chapter narrated briefly on how Evelyn and loved ones faring in life- Briony’s baby and notorious kids, shocking change in aunt Agnes influenced by her new beau- Harold, Daniel’s sweet supporting nature. It was wonderful to meet them all together celebrating Evelyn’s graduation. But it ended with confusing and worrying phone call from her Scottish cousin and thus start the adventure in Scotland accompanied by Aunt Agnes. Evelyn’s extended family was odd, distant from Evelyn and her aunt Agnes. There was huge rift among the members of the family. Every person had some issues. Iris’s children couldn’t cope with their own grieving mother. Teddy seemed okay but there was something he was hiding. Gemma was selfish and wrapped in her own cozy dreamy cocoon of bride-to-be. Lucy was not happy with Evelyn’s arrival and I couldn’t pinpoint what exactly they were afraid of by Iris’s involvement in Elderbrooke Park project. But Iris was ignorant and wrapped into her own dream project. In grieving her eldest son, she forgot to care for her other children. Martin looked only sane in that family. Even Tally and his aide were evasive about it. Whole affair looked controversial and weird even though the project was Nobel and Iris looked content and happy. And then suddenly, as usual, Evelyn stumbled upon murder. She needs to stop this you know. It felt more than coincidental finding dead body wherever she went. (She needs some religious practice to ward off the voodoo or some black magic, so that she could stop finding dead bodies wherever she went). Jokes apart, this time it seemed even harder to find culprit. The setting was beautiful and loved thought-provoking plot and graceful writing. Again Evelyn’s voice gave life to the picturesque village setting, halls of Malmo Manor, gardens of Elderbrooke Park, valleys and mountains. Her monologues made me stop again and again to ponder over the situations, history and the mystery. What I loved most was, history which was around recession, growth of manufacturing and machinery and decrease in human requirement, Societies’ criticism for veterans, their struggle for getting job. Evelyn’s philosophical musing over humanity, physical and psychological effects of war, contrast of city and village life, small community and their reservations, and on character’s nature were insightful. Idea of Elderbrooke Park was remarkable but I could see the concerns of all characters except Iris. But mostly it was Nobel and I appreciated Iris’s wish and devotion to it which was in her best interest. I also agreed with Evelyn’s thought on it. Another remarkable thing was Evelyn’s bond with her loved ones. And loved big and small development in all characters. Agnes and Evelyn’s relation improved to a great deal in this book, even after the discovery of the secret she and Iris were keeping. I enjoyed seeing different side of Agnes, enthusiastic, inquisitive, caring and supportive, a true aunt of amateur detective. Not just this but Evelyn’s bond with her cousins and Daniel also strengthened. Lucy became her second best friend whom she could confide to. Teddy developed and understood the need to move on. tragedy brought Iris’s family together once again. Oh, and finally Evelyn got some sense and started to think about Daniel and marriage seriously. Back to mystery– Many secrets came to light at Malmo Manor- Secret of Evelyn’s family, what happened to Josslyn 6 years ago and why she was killed, Teddy’s secret, question of connection between Josslyn and Tilly’s murder, how Moore, Lester and Blckwood were linked to all the mysteries. Who have thought a little Folkland village will be filled with rumors, gossips, secrets and crimes! This time, Evelyn was not alone in solving the mystery. There were helping hands and each comping up with juicy and exciting information that helped to gather the pieces of puzzle and drew a clear picture at the end. It was sad to see lively cheerful characters fall to tragedy, experience betrayal and succumb to crime and death. So many characters, so many suspects, so many questions and questionable motive. Nothing was revealed until last 20% of the book. I must say twist and turn were better than previous installments. And when tangle of the mysteries were unraveled, it didn’t fail to surprise me. It took so long to solve the mystery and so many things happened in the book that when I reached the end I forgot what the prologue was! I know slow books does that but when I read it again it was really impressive. This was slow paced mystery. I’m not fan of slow books but it was so interesting that I’m ready ignore this minor setback. Loved the end and epilogue. I wonder where Evelyn will go next and whose dead body she will stumble upon. Can’t wait to read many more adventure of Evelyn! Overall, it was slow but compelling cozy mystery with history, philosophy and juicy gossips and family drama. I can reassure readers who, like me, have not read any of the previous books in the series that The Golden Hour works perfectly well as a standalone read although there are a few references to events (some significant) in earlier books. However, there are some surprises of a personal nature awaiting even Lady Evelyn in The Golden Hour. Evelyn makes a spirited heroine with instincts naturally attuned to detection. She’s observant, perceptive, and inquisitive, not to mention determined, independent I can reassure readers who, like me, have not read any of the previous books in the series that The Golden Hour works perfectly well as a standalone read although there are a few references to events (some significant) in earlier books. However, there are some surprises of a personal nature awaiting even Lady Evelyn in The Golden Hour. Evelyn makes a spirited heroine with instincts naturally attuned to detection. She’s observant, perceptive, and inquisitive, not to mention determined, independent-minded and fearless. It turns out she’s going to need all those qualities when a murder takes place in the grounds of a country house, Elderbrooke Park, near to Malmo Manor where members of Evelyn’s extended family have gathered ahead of the wedding of her cousin, Gemma. Like all good mysteries, there is an extensive cast of possible suspects including the residents of Elderbrooke Park (many of whom bear the physical and psychological scars of war), the inhabitants of the nearby village of Falkland (not all of whom are keen on their new neighbours), servants and even members of Evelyn’s own family. There are a range of potential motives as well: blackmail, unrequited love, jealousy and family feuds, to name but a few. The story moves along at fairly leisurely speed with plenty of time for philosophical musings, lush descriptions of landscape and weather, and for Evelyn to share the results of her investigations with other characters. The pace of the book is therefore best suited to those who enjoy a gentle country stroll rather than a headlong gallop. Personally, I could have done with more of the delicious Daniel, Evelyn’s romantic interest, who frankly sounds like quite a catch. Her concern that the future of their relationship might mean giving up her cherished independence reminded me a little of the courtship between Dorothy L Sayers’ Harriet Vane and Lord Peter Wimsey in Gaudy Night. ‘The Golden Hour’ is a solidly enjoyable period whodunnit that wears its influences on its sleeve. It has an engaging heroine, a decent plot and a little bit of social commentary to keep things interesting. This is the fourth of the ‘Lady Evelyn’ mysteries from Malia Zaidi and the first that I’ve read. It’s easily digestible as a standalone work and I enjoyed it enough that I might check out the first three next time Amazon have a deal on Kindle Unlimited subscriptions. This volume sees Lady Evelyn, a plucky young woman in 1920s Britain, heading up to Scotland to visit her aunt and cousin in their mansion. Before too long there’s a murder and Lady Evelyn sets about investigating that and a previous crime in the same village. If it sounds a bit like an Agatha Christie novel, that’s because it is. In fact, it’s a lot like an Agatha Christie novel. It would be pretty remarkable if the book was as good as Christie, and it isn’t, but the good news is that Zaidi borrows well from the grand dame of the murder mystery. The mystery here is well laid out, the setting and characters (especially Lady Evelyn) are fun and after a slightly slow start the plot moves on at a pretty decent pace. Like Christie’s books, this isn’t a “cosy” mystery. The mansion is used as a halfway house for soldiers still recovering from shellshock after the First World War and the denouement is pretty dark. The PTSD theme was well handled, managing to be both appropriate for the time, and still topical today. Zaidi is clearly well aware of the debt she owes to Christie, and has the heroine reading one of her novels on the train to Scotland. She also throws in a Poirot-style scene before the final act where Lady Evelyn makes a list of suspects and motives. All this makes for a book that is honest about the fact that it isn’t desperately original, and which is readable and fun. I read the whole second half on a rainy Sunday with copious cups of tea, which suited it perfectly. If I had a criticism other than the slow start, it would be that it’s a fair bit longer than it needs to be. At nearly 400 pages it’s about 30% longer than many of Dame Agatha’s books, and the content just doesn’t justify that many pages. That aside, it’s an entertaining read and definitely worth your consideration if this kind of thing is your cup of tea. Although The Golden Hour is the first of Malia Zaidi's Lady Evelyn Mysteries I have read, it is actually the fourth in the series. It is perfectly easy to read as a standalone though and there are no spoilers for earlier books so I will be The Golden Hour is a classic whodunnit murder mystery set in late 1920s London and rural Scotland. Despite its setting, and Malia Zaidi’s close attention to period detail, it has a smart, up-to-date feel and a confident, modern heroine in Lady Evelyn Carlisle. Although The Golden Hour is the first of Malia Zaidi's Lady Evelyn Mysteries I have read, it is actually the fourth in the series. It is perfectly easy to read as a standalone though and there are no spoilers for earlier books so I will be able to go back and read them in due course. It is a series I have had my eye on for a while and I was not disappointed. The story is extremely well-written and cleverly-plotted, and much more than the 'fluffy' cosy I was perhaps expecting from the cover and synopsis (not that I mind fluff!). The book is quite long and, whilst witty and frivolous in parts, is very descriptive and emotive, and even quite moving in places. The set-up at Elderbrooke Park reminded me of Agatha Christie's They Do It with Mirrors, and Lady Evelyn herself is a bit like a cross between Miss Marple and the Honourable Daisy Dalrymple from Carola Dunn's series, but this is totally its own story. Its cast is full of dynamic, three-dimensional characters, each of whom is distinct and well-described, and the house, grounds and village are all vividly clear. I was kept guessing by the plot and enjoyed the journey through the story - it is more than 'just' a simple mystery. I will definitely be going back to read the earlier books in this series as I would like to read more about Lady Evelyn. THE GOLDEN HOUR by Malia Zaidi is an enjoyable historical mystery with plenty of characters to keep you interested. Lady Evelyn Carlisle is just figuring out what she wants from her future when she is called to Scotland by her cousin who desperately needs her help. But when Evelyn arrives nothing seems to be particularly wrong. Yet one should never judge a book by its cover and beneath the facade of this lovely community something dark is lurking, and when a body is discovered Evelyn is determined to bring the culprit to justice. That is if she is not too late to get out of the firing line herself. THE GOLDEN HOUR by Malia Zaidi is the fourth book in this series and while it is possible to read this mystery as a standalone (which is what I did), I do feel to get the most out of these characters, it would be best to read the series in order. I really enjoyed the setting and there are plenty of quirky characters to sink your teeth into and which make the suspect list nice and lengthy which is always a plus, and the pace of this mystery is even and not too energetic which gives it a relaxed edge which I enjoyed. Then, on the Mayday celebration, a Set in April 1927 and Lady Evelyn Carlisle receives a call from her cousin Gemma, she is about to be married, but wants Evelyn to arrive early in Scotland, as she is concerned about her mother’s behaviour…. This is the fourth book in the Lady Evelyn mystery series set in 1927. This is my first foray into this breathtaking series and I was not disappointed. Loved the lushness of the scenery and how detailed it all was to behold. Just great. The backdrop waffles between the UK and Scotland and relies on a lot of narrative and description. So, if you don’t like an overly wordy book, this one might not be for you. But the complex detailed mystery surely makes up for the nearly 400 pages of text. All the This is the fourth book in the Lady Evelyn mystery series set in 1927. This is my first foray into this breathtaking series and I was not disappointed. Loved the lushness of the scenery and how detailed it all was to behold. Just great. All the characters are fully crafted probably due to the fact this is book 4 in a series. Lady Evelyn was a compelling main character that held the plot together. There were a couple of stretches in logic when connecting points of the mystery near the end but overall a wonderful new author for me. Looking forward to reading other titles from her. At a loose end after finishing her degree, Lady Evelyn finds herself travelling to Scotland to see her Aunt Iris who her cousin Gemma claims is acting strangely. When she arrives at Malmo Manor there is an underlying tension which may have something So this is the fourth in the Lady Evelyn Carlisle mystery series but having not read the first books in the series, I can say it can be read as a stand-alone, as the author gives enough background about the character without spoiling the other books. My favorite of the Lady Evelyn series so far! The characters and storyline are as rich as ever. Definitely a must-read. I fully expected the Lady Evelyn Mysteries, (of which The Golden Hour is the fourth) to be your standard cosy historical - period setting, feisty aristocratic female sleuth, and country house parties galore. As a fan of the Daisy Dalrymple series, that would certainly not have been a problem, however, whilst there are similarities between the two series, I was surprised by the depth of The Golden Hour. Whilst there is indeed a feisty aristocratic female sleuth at the heart of the series, Evelyn h I fully expected the Lady Evelyn Mysteries, (of which The Golden Hour is the fourth) to be your standard cosy historical - period setting, feisty aristocratic female sleuth, and country house parties galore. As a fan of the Daisy Dalrymple series, that would certainly not have been a problem, however, whilst there are similarities between the two series, I was surprised by the depth of The Golden Hour. Whilst there is indeed a feisty aristocratic female sleuth at the heart of the series, Evelyn hasn't had the easiest of upbringings and feels quite different from many of her cosy mystery contemporaries. Orphaned at a young age, much of the book involves gentle explorations of her family ties - including a burgeoning friendship with her stern Aunt Agnes, and a renewal of relationships with the Scottish branch of her family. Like Daisy, Evelyn jumps off the page and has a vivacity that allows her to jump across the gap of ages (the book is set in the late 1920s) and feel relatable to the reader of today without feeling anachronistic. Supporting characters are also nicely realised - I particularly liked Evelyn's somewhat spiky Aunt Agnes, a wonderful picture of a traditional Edwardian matriarch who has begun to mellow under the influence of a new romance. There were, however, quite a lot of characters, especially once the action of the book moves up to Scotland, and at times I did find it a little difficult to distinguish who was who. A list of characters at the start of the book would have been helpful, especially for readers new to the series (like me) who are unfamiliar with Evelyn and her relationships with established characters such as Aunt Agnes, or Evelyn's fiancee Daniel and his family. The mystery itself is well handled - without recourse to science or police resources, Evelyn has to rely on good old-fashioned common sense and logical thinking to unravel the clues and restore harmony to Elderbrooke Park. The pace is somewhat stately - at times I did feel the plot was meandering - but the languid pace does add to the absorption into the period detail and the world of the characters. And one of the things that I did really like about the book was the fact that the mystery, whilst it does drive the plot forward, isn't always the central facet of the book. Instead, it feels like you're just living a few days with these characters, eavesdropping on their conversations and getting a real feel for the period and the everyday concerns of those living in it, whether that is a triviality such as debating over what to wear or a more serious topic such as the way to assist traumatised veterans of the first world war. Overall I very much enjoyed The Golden Hour. Whilst it was the fourth in the series, it didn't take too long to pick up the key characters and their backstory and the mystery element is fully standalone. In the Lady Evelyn mysteries I have discovered a beautifully written, classic-style cosy mystery of the kind I love. The Golden Hour is the fourth book in the series but can be read as a standalone story (as I did) quite easily. Personally, I would recommend reading the series in order (and intend to go back and do so) in order to get the full benefit of the character development and origins. Lady Evelyn is an engaging protagonist; brave, quick-witted and with a sharp sense of humour, and her various family members and friends avoid stereotypes by being complex characters with flaws, motivations and impulses of their own. I really enjoyed the tense relationships between Evelyn and her relatives, and how these developed in unexpected ways as the story progressed. This is definitely the aspect which would encourage me to read the previous books to find out more of the nuance to their history. The plot is quite complex, encompassing a multitude of suspicious characters with a plethora of potential motives and at times I became quite as confused as the bewildered sleuth! This helped to keep momentum and to keep me guessing, as the unfolding story was a fairly long one with a slow pace and a split focus on the crime investigation and family dramas. 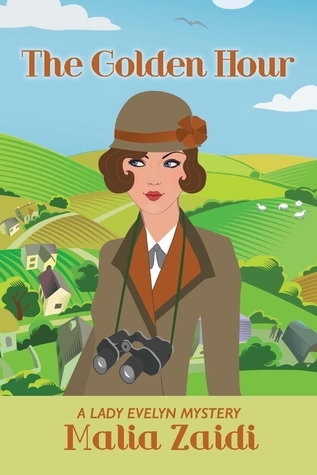 I was reminded very much of the ‘golden age’ of literary whodunnits, with nods to Agatha Christie, Dorothy L. Sayers, Ngaio Marsh, P. D. James and the like, with its rural setting, gentle pace and aristocratic amateur investigator. Yet the author still touches upon some serious modern issues too, with musings on the after-effects of war on the human psyche, and on the changing roles of women in society. Personally I loved this story, and would highly recommend it to any cosy mystery fans who enjoy a sedate and dignified pace and an intricately intriguing mystery. Lady Evelyn Carlisle is called to Scotland by her cousin, who is desperate for some help with her Aunt who has suffered from mental health issues throughout her life. Evelyn agrees to go but is dismayed (and I think a little grumpy!) that her other Aunt Agnes, decides to go with her. Although she decides this might be a good time to try and rebuild some bridges between them. On arrival, she discovers her family acting strangely, but having always been close to her Aunt, manages to find out what i Lady Evelyn Carlisle is called to Scotland by her cousin, who is desperate for some help with her Aunt who has suffered from mental health issues throughout her life. Evelyn agrees to go but is dismayed (and I think a little grumpy!) that her other Aunt Agnes, decides to go with her. Although she decides this might be a good time to try and rebuild some bridges between them. On arrival, she discovers her family acting strangely, but having always been close to her Aunt, manages to find out what is up with her. Aunt Iris opens up to her, and takes her to visit her neighbour who has opened his house up to struggling war veterans as a place to recover and recuperate through art. To celebrate, the neighbour arranges a May Day party and invites all the locals. Everything is going well (despite a few overheard moans about the type of people that might be at Elderbrooke Park…..but then Evelyn stumbles across a murder scene……She later finds out that there was a similar murder previously that remains unresolved. Will Evelyn be able to solve the mystery without endangering herself? You’ll have to read to find out! This book was brilliant! I’m a massive fan of Midsommer Murders and it kind of gave me that feel! This is number 4 in the Lady Evelyn Mystery series, and I can not wait to read the previous 3! AND I’d absolutely love a number 5! The characters are fab. Evelyn herself is a feisty independent woman who, despite the timings (1920’s) is ahead of her time and not willing to conform (remaining unmarried). She’s also loving and bright too. Her family are crazy, and I love the about them. Aunt Agnes is a little standoffish to begin with but I definitely warmed to her throughout the story….she just genuinely cares! In this sprawling cozy mystery set in post-Great War Britain, Lady Evelyn is newly returned from university when one of her Scottish cousins calls her and asks for her assistance with her mother (Lady Evelyn’s aunt). Before leaving London, she stops in at her aunt’s home, and soon her aunt is traveling with her to find out what is going on with the family in Scotland. When they arrived, much more is happening than the cousin let on. Also, a neighbor has turned his home into an artist’s retreat f In this sprawling cozy mystery set in post-Great War Britain, Lady Evelyn is newly returned from university when one of her Scottish cousins calls her and asks for her assistance with her mother (Lady Evelyn’s aunt). Before leaving London, she stops in at her aunt’s home, and soon her aunt is traveling with her to find out what is going on with the family in Scotland. When they arrived, much more is happening than the cousin let on. Also, a neighbor has turned his home into an artist’s retreat for veterans of the war. Soon, a murder happens, and then another that is related to her family. Lady Evelyn is determined to figure out all that is going on. What family secrets are there in Scotland? Who is causing these murders in this neighborhood? What exactly has Lady Evelyn stumbled upon? If you are accustomed to mysteries that get right to the point, you will need to allow yourself to savor this slow movement of this story. That’s not to say that things don't happen in an interesting fashion. In fact, I love the humorous way that Aunt Agnes got involved. But it takes a while for us to get to the mysteries at the heart of the book and even longer to untangle them. Personally, I enjoy cozy mysteries that are like this, the kind where you make yourself a cuppa and settle in for a meandering but intriguing ride. The characters in this story are well-drawn, and the settings are almost characters themselves. The characters are quirky, and many have their own goals and motivations that lead to either help or hinder Lady Evelyn. If you enjoy long cozy mysteries with a historic backdrop, you might enjoy this book. Lady Evelyn is an orphan, a graduate , a self made woman living between World Wars, when she is contacted by her cousin in a state of distress. Evelyn has 2 aunts, one of whom lives in London (Agnes) the other in Scotland (Iris) who she loves dearly. In being summoned to Scotland to her cousin’s wedding, Gemma is desperate for Eevelyn to come early and gauge her mother, Iris’ behaviour. To Eveleyn’s chagrin, Agnes invites herself along too! On arrivng at Malmo Manor, the family seat, Evelyn is unsettled by her accidental meeting with Gemma’s fiance on the train to Scotland and the opening of an artisitc retreat for war veterans, to be funded by her aunt. Her suspcions are confirmed when a body is found on opening day-but who dunnit? A feminist, ballsy detective is always welcome on my bookshelves and I think Lady Evelyn joins other Golden Age heroines such as Harriet Vane for sheer determination and stubborness. This is fourth book in the Lady Evelyn Mysteries, I had not read the previous books but I enjoyed this as a standalone. I am a real fan of golden age crime and was thrilled to be invited to join the tour for this book. I liked the character of Evelyn I thought she was a feisty and interesting character, who has been brought up by an Aunt Agnes after her parents die. Evelyn is asked to travel to Scotland to visit her Aunt Iris her Mothers and Aunt Agnes’s sister by her cousin Gemma who is about to get married and his worried about her Mother’s mental health. Evelyn in traditional cosy crime style, quickly comes across a dead body at a local Art retreat for veteran soldiers Elderbrooke Park. Evelyn starts to dig deeper to find out what is behind the murder but soon uncovers even more secrets about herself and her family. I loved the atmospheric setting of the book at the two country homes Malmo Manor and Elderbrooke Park another great addition to any classic crime story and how the story gathers pace to uncover the truth not about one murder but two. A really enjoyable read it was a slightly slower pace than I like but if you like a story to slowly bloom this is for you. This is my first novel by Malia Zaidi, but THE GOLDEN HOUR is the fourth novel in the Lady Evelyn Mysteries and I completely fell in love with this character, her family, and her adventures and I already purchased the other books in the series. Who is Lady Evelyn? Living in the London of 1920s, she is a young woman in her twenties, raised by her strict aunt Grace, just graduated from Oxford University, and refusing to get married just because that’s what is expected from her. I really like the c This is my first novel by Malia Zaidi, but THE GOLDEN HOUR is the fourth novel in the Lady Evelyn Mysteries and I completely fell in love with this character, her family, and her adventures and I already purchased the other books in the series. Who is Lady Evelyn? Living in the London of 1920s, she is a young woman in her twenties, raised by her strict aunt Grace, just graduated from Oxford University, and refusing to get married just because that’s what is expected from her. I really like the character of Evelyn. She is independent and smart, she speaks up her own mind, and she lives with her boyfriend Daniel, not at all concerned that it’s considered a scandal at the time since they are not married. Like me, she loves Agatha Christie novels, but, unlike me, she always finds herself involved in a murder investigation. Usually with these mystery type novels, the action moves faster. Zaidi’s novel exists in opposition to this. It is slow and meandering, delving deeper into the family drama more than the murder mystery hand. Evelyn has a curious mind, but she cannot appear too overt in her investigation, so we are exposed to a kind of Austen set-up, where characters are adept at visiting and drinking tea in company. For all the placid and pleasant surface that is Falkland, underneath lies dark truths. The murder Usually with these mystery type novels, the action moves faster. Zaidi’s novel exists in opposition to this. It is slow and meandering, delving deeper into the family drama more than the murder mystery hand. Evelyn has a curious mind, but she cannot appear too overt in her investigation, so we are exposed to a kind of Austen set-up, where characters are adept at visiting and drinking tea in company. For all the placid and pleasant surface that is Falkland, underneath lies dark truths. The murder of a young woman at Elderbrooke park is not the first murder to occur around these parts, elevating what initially seemed isolated to something infinitely more sinister. I didn't realize when I read this that there were three previous books in the series, so don't worry about reading them out of order. Evie (Lady Evelyn Carlisle) is a strong woman, level headed and smart. She's also very introspective, which makes for a long book but necessary since her musings give insight into the family dynamics. She cares about everyone around her, even the servants who others don't seem to notice. And she wants to see justice done for not one but two murders that she is cer I didn't realize when I read this that there were three previous books in the series, so don't worry about reading them out of order. Evie (Lady Evelyn Carlisle) is a strong woman, level headed and smart. She's also very introspective, which makes for a long book but necessary since her musings give insight into the family dynamics. She cares about everyone around her, even the servants who others don't seem to notice. And she wants to see justice done for not one but two murders that she is certain are linked somehow. And she's brave in the face of danger, which is a very good quality for a sleuth to have. I really enjoyed this book and will go back to the first book and read it. April 1927 and Lady Evelyn Carlisle receives a call to urgently travel to Malma Manor, near Falkland as her cousin Gemma is concerned about her own mother. But things are not what they seem, and which are made worse by one of their neighbours at Elderbrooke Park making his home into a retreat for artistic veterans of the Great War. At an opening day, a body is discovered by Lady Evelyn and she is determined to help catch the guilty party. Another slow placed, well-written mystery. An entertaining April 1927 and Lady Evelyn Carlisle receives a call to urgently travel to Malma Manor, near Falkland as her cousin Gemma is concerned about her own mother. But things are not what they seem, and which are made worse by one of their neighbours at Elderbrooke Park making his home into a retreat for artistic veterans of the Great War. At an opening day, a body is discovered by Lady Evelyn and she is determined to help catch the guilty party. Another slow placed, well-written mystery. An entertaining read with its varied and well-developed characters. I loved this newest installment of the Lady Evelyn series, it builds beautifully on the first three installments! My favorite characters are all back, along with some new characters, a new location, and a new gripping mystery. But my favorite part of this book (and all of the books in the series) is Evelyn herself. Evelyn is both bold and level-headed, caring toward her family and shrewd in the face of danger. I don't often read mysteries, but for this series, I make an exception! Filled with old world charm and great characters. I absolutely love the main protagonist of the story but I don't quite know what to make of her living with her intended and her desire to wait to marry, at least not during this time in history. I guess that would make her unusual for her time and intriguing. Either way, the story is fabulous and will keep you turning pages. I really enjoyed this book in the lady Carlisle series. Well written and researched, good length and moved along well. Unfortunately I spotted the murderer before the murder but I've read a lot of Agatha Christie! With realistic family dynamics, The Golden Hour depicts a European family who has dealt with loss and is planning a wedding within the younger generation. Of the three matriarchs, one has died. Our main character lost her mother at a young age and was raised by an aunt, yet feels the other aunt must have been more like her mother. When this aunt shows signs of mental decline, our main character is called in by the bride-to-be for support. While a bit slow-moving, the book is beautifully written. I am the author of A Poisonous Journey, A Darker Shore, The Study of Silence and The Golden Hour the first four novels in the new Lady Evelyn Mystery series.